Workforce training gives people the skills they need to get good jobs and support their families. These programs are also important to our Commonwealth more broadly, since we rely on well-educated, highly-skilled workers to sustain our state’s high-wage economy. 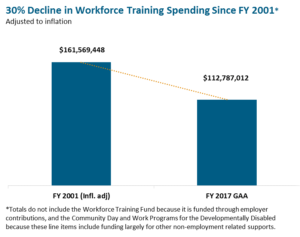 Despite the evidence that workforce training gives people the skills they need to succeed, state funding for workforce training has fallen over time, down 30 percent between Fiscal Years 2001 and 2017, as indicated below. 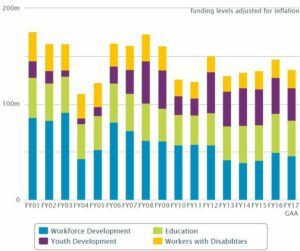 MassBudget’s new paper Investing in People: Workforce Training in the Massachusetts State Budget analyzes these long-term trends while also walking users through our interactive on-line Jobs & Workforce Budget tool. Together these resources describe each workforce training program funded by the state, show funding histories, and highlight broader trends across programs that provide similar supports. The Jobs & Workforce Budget also provides highlights from this year’s state budget. Through recent work, state officials and leaders from the workforce training community have recognized the SNAP Employment & Training program as one important opportunity to help offset some of these long-term cuts. To describe this promising opportunity to support training for people eligible for SNAP (formerly called food stamps), MassBudget is also releasing The SNAP Employment & Training Program: Opportunities to Expand Work Supports for Low-Income People in Massachusetts. The SNAP Employment & Training program funds workforce training and related supports like transportation and childcare for people receiving training. Federal funds can reimburse 50 percent of state and local spending and can be used both to expand services and to offset some existing state costs. The Massachusetts Budget and Policy Center (MassBudget) produces policy research, analysis, and data-driven recommendations focused on improving the lives of low- and middle-income children and adults, strengthening our state’s economy, and enhancing the quality of life in Massachusetts.